Osceola (Iowa) Food, the local manufacturing plant owned by Hormel Foods Corporation (NYSE: HRL), recently donated $3,000 to the Food Bank of Iowa for the local elementary school backpack program, and $7,000 to Clarke County Food Pantry to help those in need. For the fifth consecutive year, Hormel Foods is giving funds to U.S. manufacturing facilities to share with nonprofits in their respective communities to fight hunger. In 2014, Hormel Foods donated $390,000 to local hunger relief organizations in 39 U.S. communities where it has manufacturing facilities, bringing the program’s total contribution to local hunger relief efforts to nearly $1 million thus far. In 2015, the company will provide 39 plant locations with funds to continue the program. Hormel Foods is helping those in need both in the United States and internationally through its On Our Way to Ending Hunger program. The company collaborates with retailers, nonprofits and the government on hunger relief efforts; nourishes the hungry in the U.S. and abroad; and motivates individuals and corporate partners to take action to fight hunger. 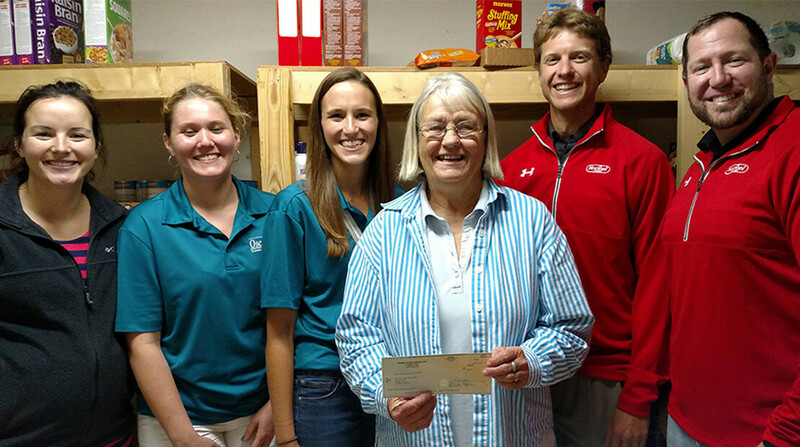 Hormel Foods donation helps fight hunger in Osceola Osceola Foods, donated $3,000 to the Food Bank of Iowa for the local elementary school backpack program, and $7,000 to Clarke County Food Pantry. Hormel plant raises more than $4,200 for cancer research Hormel Foods plant employees recently donated more than $4,200 in support for The Hormel Institute’s cancer research in memory of a former leader. Hormel Foods Corporation, based in Austin, Minn., is a multinational manufacturer and marketer of consumer-branded food and meat products, many of which are among the best known and trusted in the food industry. The company leverages its extensive expertise, innovation and high competencies in pork and turkey processing and marketing to bring branded, value-added products to the global marketplace. The company is a member of the Standard & Poor’s (S&P) 500 Index, S&P 500 Dividend Aristocrats for 2014, was named the 2013 Sustainable Supply Chain of the Year by Refrigerated & Frozen Foods magazine, and was again named one of “The 100 Best Corporate Citizens” by Corporate Responsibility Magazine for the seventh year in a row. Hormel Foods was also recognized as a 2015 Military Friendly Employer by G.I. Jobs magazine, on the 2015 Best for Vets Employers List by Military Times, and was named one of the 2015 40 Best Companies for Leaders by Chief Executive magazine. The company enjoys a strong reputation among consumers, retail grocers, foodservice and industrial customers for products highly regarded for quality, taste, nutrition, convenience and value. For more information, visit https://www.hormelfoods.com.